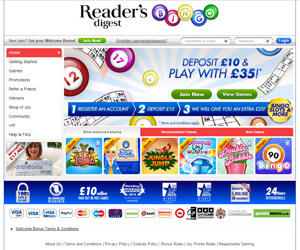 Reader's Digest Bingo Review | Join & Get £25 FREE NOW! Readers Digest Bingo is part of the Jackpotjoy Network and features an incredible selection of top bingo games and promotions. Players are spoiled for choice when it comes to the Reader's Digest Bingo promotions selection, especially because the promos are sourced directly from the Jackpotjoy promo cache. One of the best promos currently on offers is the March Madness promo package, which offers a whole month of bingo specials, cashback deals and more. One of Lord Bingo's all-time favourite promos at Reader's Digest Bingo is Super Links which gives you the chance to win £20,000 in Bingo guarantees every single day. Another hot promo that you can enjoy is the Cashback King special which lets you earn 10% in casino cashbacks every single Wednesday. Also, be sure no to miss out on the Daily Sale Wheel which lets you enjoy cashback specials on selected slots. Reader's Digest offers players an absolutely massive selection of different games to choose from. It goes without saying that they have a fabulous variety of 90-ball and 75-ball bingo games. For those into traditional bingo gameplay, be sure to check out the Bingo90 and Bingo 75 rooms which offer big money jackpots and exctiting chat games. Another cool version of 75-ball is offered in the Take Me Out bingo promo which provides you with a nice 75-ball bingo game absolutely stacked with bonus games and a whopping community jackpot. In addition to their amazing bingo selection, Reader's Digest Bingo offers all sorts of instant games such as scratchcards, casino games, video poker, jackpot games and plenty of different kinds of slots. They even have a fast-paced version of keno which lets you win big cash prizes instantly. One of the hottest new games currently on offer is Tiki Totems which gives you brilliant multiline slot gameplay. Also, be sure not to miss out The Million Pound Drop which gives you the chance to win a massive £26,000 top payout!